SHOULD YOU SELL YOUR TUCSON HOME FOR CASH? 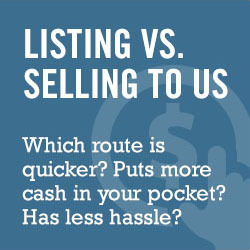 There are many benefits of dealing with an all cash buyer when selling your Tucson home. Know the deal is going to get done: There is nothing more frustrating than seeing a deal break down in escrow due to financing. That will not happen when you deal with us as an all cash buyer. Know you don’t have to pay commissions: When we buy your house for all cash you don’t have to list your home. That means no huge real estate commissions! Know that you are not going to have to waste time: How nice would it be to sell your home to someone that can pay all cash and will not waste your time. When listing a home it can be a huge waste of time always having your home show ready and having to leave every time someone wants to see your home. When dealing with us, you show us your home once and that is it! Know that you don’t have to do any repairs: When we buy your home all cash you don’t have to do any repairs. We are going to assume the responsibility for all the needed repairs. We are buying your house in “AS IS” condition. If you are considering selling your home give us a call at 520-433-9298 or fill out the form below.